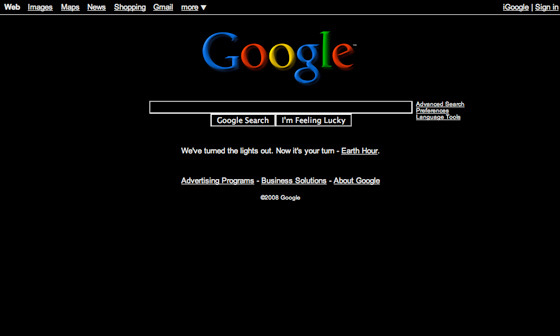 As we noted two days ago, Google is taking its home page black in support of Earth Hour. We criticized Google when we first posted about this because, it turns out, black web pages actually may use more power than white ones (based on a study that Google itself cited last year). So Google is, ironically, causing people who visit their site to use more power to celebrate Earth Hour than they would on a normal day. Google changed its message to users to note the disparity (compare to what they said to Israeli users two days ago), but I still find this all very funny.